Moodbidri is about 35 km from Mangalore. This place is usually described as ‘Jaina Kashi’ and is the seat of Jain philosophy. You can find a lot of Jain temples here. It is known for the 18 basadis, the most famous of them being ‘Savira Kambada Basadi’ (thousand pillar temple) built in 1430. The temple is intricately carved and has an architecture that is peculiar to Nepal. Please watch this slide show of Moddbidri and Karkala. Karkala is about 45 kms from Mangalore, this place is famous for Gomateshwara Betta and Venkata Ramana Temple. This temple is famous for its beautifully carved stone pillars. Renovated a few decades ago, the stone carved pillars were created by the famous sculptor, Sri Renjal Gopalakrishna Shenoy. The most unique feature of the stone carved pillars is that each pillar has a beautiful rose and each rose has a honey-bee sitting on it. The carving is so delicate and intricate that even the six legs of the honey-bee are clearly visible. the Gomateshwara Temple is renowned for the 42 ft tall granite monolithicstatue of Gomateshwara built in 1432 AD. It was built by Pandya Raja. The huge basadi in Karkala is the Chaturmukha basadi which is also worth visiting. St. Lawrence Church, Athur is also a place of attraction. 5 km to the east of Udupi is a small town, called Manipal, a unique place for learning. Manipal is a successful experiment in transforming itself into an international university town. It is all the hard and sincere labor, love put in by a dedicated doctor, Dr. TMA Pai. It also has the magnificent Venugopal temple. Hasta Shilpa, a house built in traditional style by Mr. Vijayanath Shenoy and furnished with antiquities which he collected over his lifetime, is something which you should not miss. Kasturba Medical College Museum is yet another place amidst beautiful surroundings, is the anatomy museum. Land’s End, as the name suggests, it is an extra-ordinarily picturesque view-point which is at one end of Manipal. It overlooks the lush green fields and a river far below, and one can view the scenery as far as your eyes can explore. Watch Video from Manipal. Barkur, the traditional capital of Tuluvas, which is about 74 km from Mangalore, was for long time the local seat of the representatives of the Hoysala Ballalas of Dorasamudra, who were Jains by religion. Ruined tanks, Jain shrines and sculptures are still extant. The place has several temples, containing inscriptions of historical importance. 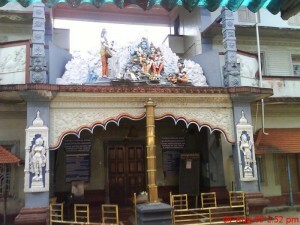 Above : Chaulikeri-Ganesha Temple Garbhagriha. Watch Video from Barkur. Anegudde means elephant (Aane) hillock (Gudde) and it is the abode of the elephant god, Sri Vinayaka. It is one of the seven places of pilgrimage in the region called ‘Parashurama Srishti’ which are believed to be created by sage Parashurama. Situated in Kumbhashi, Anegudde is about 100 kms from Mangalore and 9 kms from Kundapur. The eighth century Sri Siddhivinayaka Temple at Hattiyangadi in Kundapur taluk is a historical and well-known pilgrimage centre for Hindus of the coast. Hattiyangadi (Pattinagara) was the capital of Alupa Kings, who ruled the Tulunadu during seventh and eighth centuries. They had close ties with some other Jain cities such as Purigere (Lakshmeeshwara) and Hombuja (Humcha). Later Hoysala and Honnekambala Kings ruled Hattiyangadi, which was also known as Goshtipura, as it hosted a number of intellectual debates. Hattiangadi, about 8 kms to the the northeast of Kundapur, which is famous for the ancient Siddhi Vinayaka Temple, also houses many other ancient Temples and Jaina Basadis. Murudeshwara lies at a deviation of 1 kilometer from the National Highway NH-17 between the towns of Honnavar and Bhatkal. A big arched entrance on the Highway marks the entrance of the road to Murudeshwara. From Mumbai and Mangalore, one can take the NH-17 to reach Murudeshwara. From Bangalore one can take the NH-206 to reach Honnavar and then take NH-17 to reach Murudeshwara. Total distance from Bangalore to Murudeshwara works out to be 455 km. Murudeshwara station lies on the Konkan Railway. Some trains from Mumbai and Mangalore stop here. There are no direct trains from Bangalore. Alternatively, one can alight at Bhatkal station. Idagunji is a famous place of Hindu worship in Uttara Kannada district and Honnavar taluk. The Lord Ganesha temple is the main attraction, receiving more than 1 million devotees per year. Idugunji is close to Manki Mavinakatte and about 14 km from Honnavar, 28 Km from Navilgona. This is situated in Kasargod District in Kerala State around 40 kms from Mangalore. This is a beautiful fort built very close to the sea. Many movies are being shot here from time to time for its ethnic beauty. One of the popular Hindi movie Bombay is is shot here. Watch Bekal Fort Video. This entry was posted in Mangalore and tagged ''kerala, Add new tag, Alupa Kings, Annegudda, Annegudda Sri Vinayaka Temple, Barkur, beka fort, bekal fort, bekala fort, Chaturmukha basadi, Chaulikeri Ganesha Temple, Dorasamudra, Dr. TMA Pai, gomateshwara, Hasta Shilpa, Hattiyangadi, Hindu god Shiva, Honnavar, Honnavar taluk, Honnekambala Kings, Hoysala, Hoysala Ballalas, Idagunji, Idagunji Vinayaka Temple, India, Jaina Kashi, Karkala, karnataka, kasargod, Kasturba Medical College, Konkan Railway, Kumbhashi, Kundapur, Mangalore, manipal, Moodbidri, movie Bombay, Mumbai to Mangalore, Murudeshwara, Navilgona, Parashurama, Parashurama Srishti, Renjal Gopalakrishna Shenoy, Savira Kambada Basadi, Siddhivinayaka Temple Hattiyangadi, South Kanara, St. Lawrence Church, thousand pillar temple, Tulu, tulunadu, Tuluvas, udupi, Uttara Kannada, Venkata Ramana Temple, Venugopal temple, Vijayanath Shenoy. Bookmark the permalink.